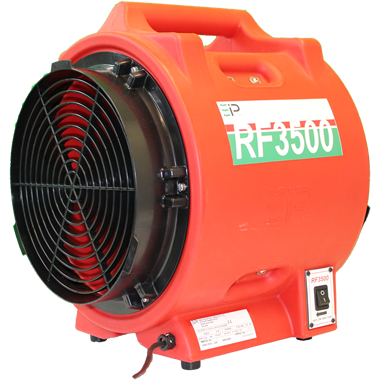 Welcome to the RF3500, the first heavy duty power ventilator to be designed and built specifically to the hire industry standards. With its rugged construction and unique long distance ducting capability, it’s the ideal choice for the hire fleet manager. Whatever the application, the EIPL RF3500 has the capacity your customer needs. Wherever adverse environmental conditions pose a threat to health, safety and efficiency, the RF3500 ventilator can be used in one of three ways to improve air quality. Like all EIPL hire shop equipment, the RF3500 is built to rigorous hire industry standards. It’s robust, welded steel construction guarantees exceptional rapid payback and many years of revenue generating service. Hot and humid conditions are uncomfortable and lead to reductions in work force efficiency. By introducing a constant flow of fresh air, the RF3500 ensures that even the hottest areas become cool and comfortable. Conditions in crowded or poorly ventilated rooms are unpleasant and unhealthy. A lack of oxygen in the air causes drowsiness, making operation of machinery dangerous. An EIPL RF3500 can ensure a constant supply of fresh oxygen-rich air. In areas where fumes, dust or unpleasant smells prevail, the build-up can be a risk to health and safety. The RF3500 has the power to extract huge amounts of contaminated air though it’s heavy duty, non-collapsible flexible ducting.